We have rescheduled Polo on the Brazos for Spring 2017! Please check back in the Spring for the new event date and more updates!!! 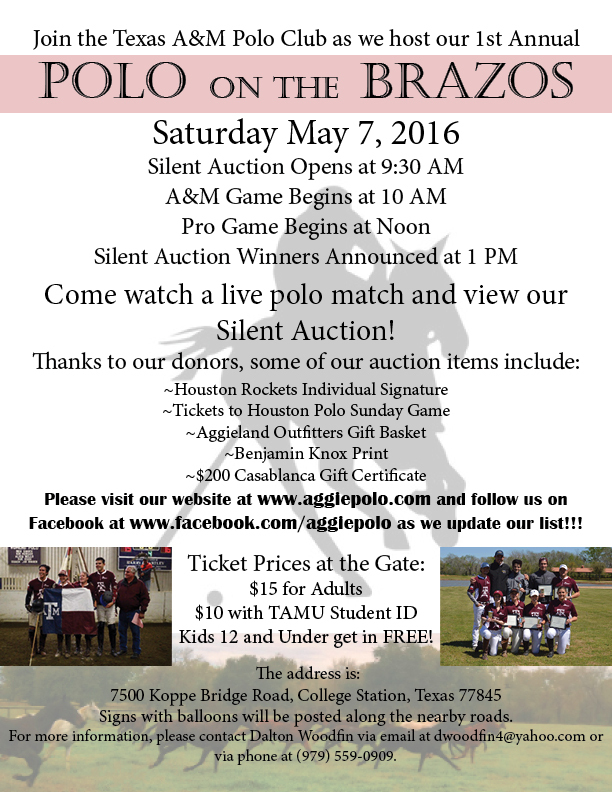 Join the Texas A&M Polo Club as we host our first annual POLO ON THE BRAZOS! Curious about the sport of kings? Want to see the collegiate national champions of arena polo in action? Come watch a live polo match and view our silent auction! Ticket prices at the gate will be $15 for adults, $10 for TAMU students with student ID, and FREE for kids 12 and under! Attire is casual. ALL PROCEEDS FROM POLO ON THE BRAZOS WILL GO TOWARD PURCHASING A NEW TRAILER FOR THE TEXAS A&M POLO CLUB AND CARE OF THE TEXAS A&M POLO HORSES.